The adverse impacts of alien plant invasions on water flows have been a prime motivation for South Africa's Working for Water Programme. The approach used in this study builds on a previous national assessment in 1998 by incorporating factors that limit plant water-use, information from recent research and improved flow reduction models. The total reduction in flows is estimated to be 1 444 million m3-yr-1 or 2.9% of the naturalised mean annual runoff (MAR), less than half of the 3 300 million m3-yr-1 estimated in 1998. Two main factors account for this difference: (a) a decrease in the estimated unit-area flow reduction to 970 m3-ha-1-yr-1 compared with 1 900 m3-ha-1-yr-1 estimated in 1998, largely due to the new model being based on more representative reduction factors; and (b) the updated estimate of the condensed invaded area of 1.50 million ha (previously 1.76 million ha), although the taxa mapped for this assessment only accounted for 1.00 million of the 1.76 million ha reported in 1998. Reductions due to invasions in Lesotho are estimated to be about 161 million m3-yr-1 and those in Swaziland about 193 million m3-yr-1. The taxon with the greatest estimated impact was wattles (Acacia mearnsii, A. dealbata, A. decurrens) with 34.0% of the total reductions, followed by Pinus species (19.3%) and Eucalyptus species (15.8%). The revised estimate is considered on the low side largely because the extent and impacts of riparian invasions have been underestimated. If the current estimates that 4-6% of Acacia mearnsii, Eucalyptus, Populus and Salix invasions are riparian, are adjusted to a more representative 20%, 50%, 80% and 80%, respectively, the total reductions increase by nearly 70% to ~2 444 million m3-yr-1. Producing these estimates involved a number of assumptions and extrapolations, and further research is needed to provide more robust estimates of the impacts. 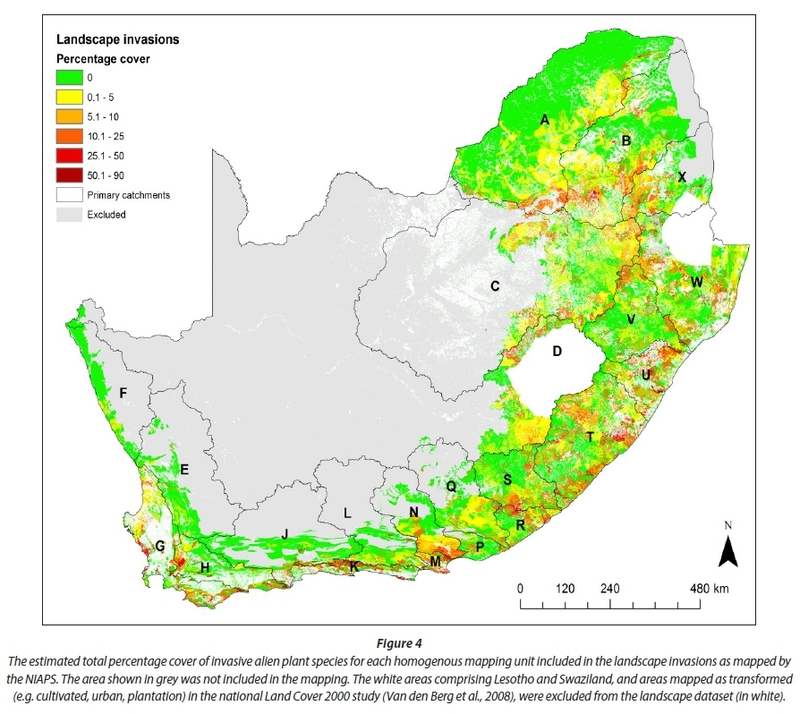 Estimates of the impacts of alien plant invasions on surface water runoff in South Africa were, and continue to be, a key factor in motivating for the establishment and continuation of the Working for Water programme (Van Wilgen et al., 1998). The last national estimate of the impacts (Versfeld et al., 1998) used a limited set of models for estimating the biomass of stands of invasive alien plants and then converted that to estimates of the impacts on mean annual surface runoff (Görgens and Van Wilgen, 2004; Le Maitre et al., 2000). Since then additional information has been gathered on the water-use of invasive alien plants (reviewed by Le Maitre et al., 2015) and a new dataset on the distribution, species composition and density of invasions has become available - The National Invasive Alien Plant Survey (NIAPS, Kotzé et al., 2010). These two advances provide the basis for new estimates of the impacts of invasions on both river flows and groundwater resources - termed water flows in this paper. Estimating the hydrological impacts of invasive alien plants at a national scale requires the use of assumptions, inferences and surrogates, and making pragmatic choices. In essence though, such choices are not too different to those used in, for example, estimating runoff in ungauged and modified catchments, as was done for national water resource assessments, such as Middleton and Bailey (2008). The results of the modelling exercise using the NIAPS data have been presented in detail for invasions in dryland, riparian and groundwater aquifer settings by Le Maitre et al. (2013). This paper focuses on the combined impacts of all invasions in South Africa and estimates for Swaziland and Lesotho are reported separately. The invading species were grouped into three biomass classes and estimates of mean plant age were applied to different settings (e.g. fynbos versus grasslands, dryland versus riparian) to allow for the greater water use of plants in riparian zones. The model could overestimate reductions (Cullis et al., 2007) because it made no allowance for the fact that flow reductions caused by invasions cannot exceed the rainfall in the long-term (Calder et al., 1997). This weakness was addressed by reworking the model so that the flow reductions were expressed as proportions, based on revised biomass equations (Dzvukamanja et al., 2005; Le Maitre and Görgens, 2003), like the flow reduction models for forest plantations developed by Scott and Smith (1997). The revised models still require assumptions about mean plant ages and growth rates in dryland settings for estimating the biomass. But, because reductions are limited to a proportion of the current MAR, they conform to the Budyko (1974) model's principle of evaporation being limited by the available water. One of the key issues in modelling the impacts on plant invasions is the range of growth forms and variety of traits and their potential effects on water-use (transpiration and interception). Although the NIAPS included fewer taxa than Versfeld et al. (1998), the taxa comprise contrasting growth forms. They also vary in their physiology, phenology, rooting depths, leaf areas and leaf area indexes, and other factors that affect their potential water-use (Calder, 1999; Görgens and Van Wilgen, 2004; Lavorel and Garnier, 2002; Lavorel et al., 1997; Le Maitre, 2004; Le Maitre et al. 2015). A key trait that is directly related to interception, transpiration and plant growth is the leaf-area index (Calder, 1999; Running and Coughlan, 1987; Zhang et al., 1999). The limited data on the leaf-area index of the invading taxa mapped for the NIAPS suggest that it explains some of the observed variations in water-use between different taxa (Le Maitre et al., 2015). Interception losses are often considered important (Calder, 1999). Some local studies found that they were low (<10% of total evaporation) for plantation tree species in South Africa (Dye, 1996), but Everson et al. (2007) and Bulcock and Jewitt (2010) have recorded relatively high interception losses in Acacia mearnsii (±30%), Eucalyptusgrandis (±15%) and Pinuspatula (±21%). As leaf-area is an important factor in interception storage, high leaf-areas may result in high interception losses and account for some of the observed variations in water-use between species. Interception losses are also known to be rainfall-intensity and raindrop-size dependent (Calder, 1999), but taking this into account was beyond the scope of this study. The impacts will also vary depending on the size (age) and density or canopy cover of the invasions. In the original study the effects of increasing canopy cover were assumed to be linear so that the areas could be adjusted to its equivalent with 100% canopy cover (also termed the 'condensed' area) to simplify calculations (Le Maitre et al., 1996). This assumption is contradicted by the typical sigmoidal change in streamflow with increasing tree or stand age observed in long-term studies (e.g. 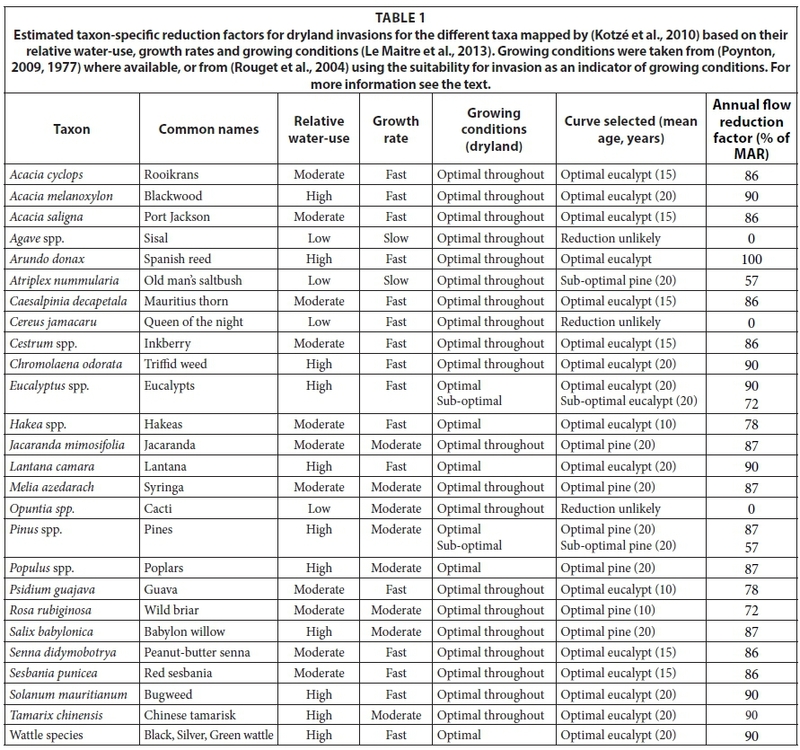 Bosch and Von Gadow, 1990; Dye, 1996; Le Maitre and Versfeld, 1997; Zhao et al., 2012), which is the result of increasing plant size and canopy cover. Initially a plantation comprises small saplings with < 1% canopy cover, and streamflow reductions are not detectable. As the trees grow, the reductions in streamflow increase rapidly until they reach an asymptote (maximum) at about the stage when canopy cover reaches 100%, which is well before biomass peaks (Le Maitre and Versfeld, 1997). Unfortunately, there are insufficient data on the rate of canopy cover increase for invading plant species to be able to parameterise such a sigmoi-dal relationship. So this assessment has used a linear relationship with canopy cover (density). The biomass-based approach assumed that species with a high biomass have high water-use while those with low biomass did not. However, a number of species with relatively low biomass (e.g. Chromolaena, Lantana) have been found to have relatively high evapotranspiration rates, comparable to large trees (Meininger and Jarmain, 2014). For this assessment, species-specific reduction factors were adopted, building on the initial relationships developed by Scott and Smith (1997) and applied to invading species by Cullis et al. (2007) and Mallory et al. (2011). 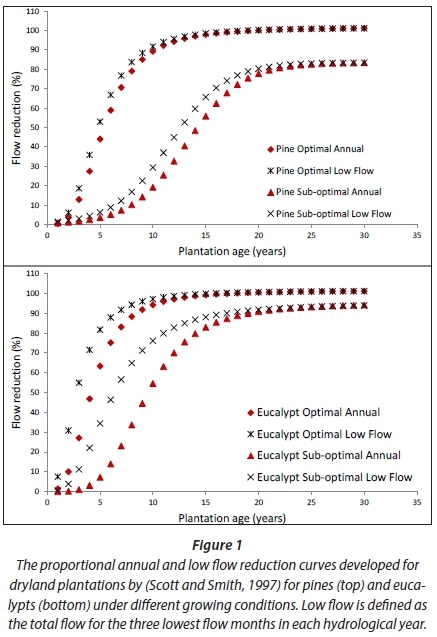 The flow reduction functions require estimates of mean plant age and assume equal proportions of invasions in each age class. The mean reduction is then estimated by calculating the reduction for each age class and then calculating the overall mean for all age classes. Thus, for example, a mean age of 10 years means that the ages will range from 1 to 20 years and the overall mean is calculated from the 20 individual reduction factors. Two sets of curves were provided by Scott and Smith (1997; Fig. 1) and differentiate: (a) between species which grow fast and rapidly occupy a site (eucalypt or short-lag) and those that do so slowly (pine or long-lag), and (b) between those growing under optimal and sub-optimal conditions where those under optimal conditions achieve a greater potential reduction and achieve it more rapidly than under sub-optimal conditions (Scott and Smith, 1997; Scott et al., 1998). In the case of eucalypts, for example, the highveld is generally considered to be sub-optimal, with optimal growing conditions being found in the high-rainfall, warmer regions, like the middle and lower escarpment and lowveld in Mpumalanga, and the KwaZulu-Natal midlands and coastal belt (Poynton, 1977). Within the areas of eucalypt invasions mapped by the NIAPS, sub-optimal growing conditions are largely confined to the eastern Free State, Gauteng and the Mpumalanga highveld. For Acacia cyclops, A. saligna, A. mel-anoxylon and wattles (Acacia mearnsii, A. dealbata, A. decur-rens) the conditions are optimal throughout the area where the NIAPS mapped invasions based on Rouget et al. (2004) data and Poynton (2009). Arundo donax invasions are almost exclusively riparian. It grows very fast and has high water use (Watts and Moore, 2011), so its reductions would be 100% of the amount estimated for riparian wattles (Dye and Jarmain, 2004). Fast growing, high water-use species (e.g. Chromolaena) were given a greater age to reflect the fact that they occupy the site more rapidly than the Eucalyptus species in the catchments included in the Scott and Smith (1997) study. The models for optimal pine growing conditions apply in areas where there are plantations on deep, relatively fertile soils (Poynton, 1977). In the Fynbos and Grassland biomes, most invasions are in montane areas with relatively shallow soils which, in the Western Cape, are mostly relatively infertile. Thus in most areas, mapped pine invasions are on sub-optimal sites making the sub-optimal reduction curve more appropriate than the optimal one. Established pine trees are relatively fire resistant and tend to survive fires, so the mean age can be greater than the fire-return interval; a mean age of 15 years has been used. Poplar species are relatively slow growing but do well throughout the parts of South Africa where they were mapped by the NIAPS based on Poynton (2009), and are also almost invariably riparian invaders. Riparian invasions by taxa with a relatively high water-use (wattles, eucalypts, poplars, willows) were given a proportional reduction factor of 100% and the other species were given the taxon-specific dryland reduction factors (Table 1). Based on the findings of Dye and Jarmain (2004) and Clulow et al. (2011), the calculated reduction was then multiplied by 2.0 for riparian invasions in grasslands and savanna areas (where the grasses are dormant in winter) and 1.5 for the other biomes where the indigenous riparian species are evergreen. In areas where additional groundwater is potentially available, the dryland flow reduction was multiplied by 1.2 (Van Wilgen et al., 2008). We acknowledge that the actual differences would depend on the local climatic conditions (e.g. evaporative demand), moisture availability, and vegetation structure, but there are insufficient data to support the development of models to take this into account in this study. The greater water use of species in settings where additional water is available, namely, floodplains, riparian zones, wetlands or areas where groundwater can be reached by root systems, means that such areas need to be identified. Unfortunately there is no single national-scale dataset that defines such areas, so surrogates have to be used to identify where such water is located and roughly how much is available. Two key sources of such information at a national scale are: (a) vegetation types whose structure and dynamics differs from those of adjacent areas, particularly where the plants are taller and have a denser canopy, or are evergreen rather than drought deciduous, indicating greater water availability (Colvin et al., 2007); and (b) maps of soils or geological formations which indicate accumulations of material which can function as an aquifer. 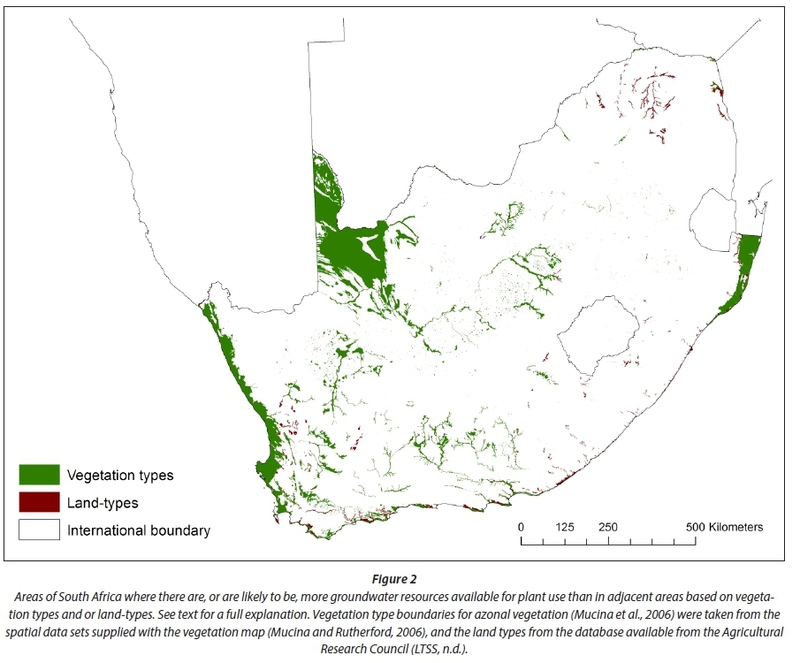 The national vegetation map (Mucina and Rutherford, 2006) recognises a number of 'azonal' and other vegetation types which are associated with deep soils or additional water availability in the landscape (e.g. alluvial, dune or sand plain vegetation types and wetlands) (Mucina et al., 2006), also termed groundwater-dependent ecosystems (Colvin et al. 2007). These vegetation types were selected and used to create a national dataset of areas where the vegetation indicates greater water availability than in the adjacent areas (Fig. 2). The land-type classification developed for South Africa (LTSS, not dated) was found to provide the most detailed mapping of soil characteristics, including depth and potential for development of deep root systems. The selected vegetation and land types were combined to create a single spatial dataset for use in this study. However, there are many river reaches where there are no mapped features which can indicate the extent of the riparian zone - i.e. where additional water would be available to plants. One option is simply to assume that a proportion of each catchment is riparian as done by Scott et al. (1998), Cullis et al. (2007) and Van Wilgen et al. (2008). The other is to define a strip by establishing a width (buffer) each side of each river reach. One constraint on defining narrow riparian zones was that the NIAPS data used a raster format with pixels of 250 x 250 m making this the minimum width for defining riparian zones and identifying riparian invasions. The other constraint was the choice of the river dataset to buffer in this way. The only hydrologically correct national river dataset is at a scale of 1:500 000 (Silberbauer, 2006) but these rivers are only a fraction of those represented on, for example, 1:250 000 topographical maps. In the end we chose to compensate for the underestimation of the river length, and thus of the extent of the buffered area, by maintaining a minimum width of 250 m, although this is known to be wider than the riparian zone of most rivers (Versfeld et al., 1998). However, we did provide a separate estimate using the riparian dataset so that the results can be compared with the landscape-derived riparian estimates as described above. The concept of the water balance states that, in the long-term, variations in water storage in a closed catchment cancel out (Budyko, 1974), so that changes in evaporation are reflected in corresponding changes in runoff. This allows differences in evaporation due to invasions to be expressed as flow changes relative to the pre-invasion conditions, also termed incremental differences in runoff. Naturalised mean annual runoff (MAR) data are available for quaternary (4th order) catchments, which range from about 4 800 to 180 000 ha (Middleton and Bailey, 2008). In the rugged mountain areas (e.g. Cape folded belt, Drakensberg escarpment), the range in the mean annual rainfall, and thus MAR, in such catchments can exceed an order of magnitude. The MAR for a quaternary may, therefore, not be an accurate estimate of the runoff in the specific areas within that quaternary that have been invaded, especially given that invasions are not evenly distributed across the catchments. However, there is a set of Pitman-based rainfall-runoff curves which were developed for national water resource assessments and are matched with groups of quaternary catchments, called hydrological zones (Scott et al., 1998). Mean annual rainfall estimates are available as a raster dataset at a resolution of 1x1 arc minute (Schulze et al., 1997), so these rainfall-runoff curves were used to generate a MAR raster dataset at the same resolution as the rainfall. 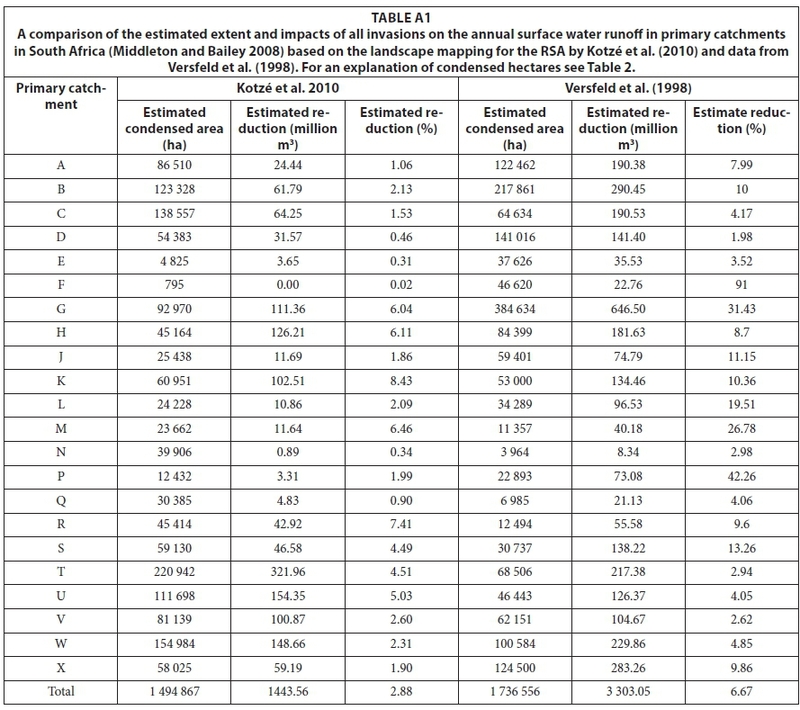 These estimates were summed and rescaled so that the total for the catchment equalled the quaternary MAR estimated by Middleton and Bailey (2008). Using this MAR grid to estimate the MAR for each of the homogeneous mapping units (HMUs) used in the NIAPS (Kotzé et al., 2010) proved problematic due to raster alignment issues, so the MAR raster was resampled and interpolated using a bilinear, nearest-neighbour technique to provide an estimate for each invaded spatial unit (250 x 250 m). The mean interpolated MAR for each HMU was used in the dryland invasion flow reduction calculations. The amount of additional water available in river flood-plains and shallow aquifers depends on the rainfall regime and the river flow regime or on other sources of recharge such as lateral inflows. More water will be available to plants on the floodplain of a perennial river than on an ephemeral river, with most perennial rivers flowing through arid environments effectively losing rather than gaining water. Although the 1:500 000 river dataset includes a category for perenniality (Silberbauer, 2006), the data are incomplete and inaccurate. The data were corrected and updated for a recent river conservation study (Nel et al., 2011), but this only distinguished between perennial and ephemeral, which is too coarse for this study. Flow statistics are available for individual quaternaries from the Spatsim model (Hughes and Palmer, 2005), including the proportion of months with zero flows in the 70-year naturalised flow record. Each of the ephemeral river reaches was matched with a proportion of zero flows while perennial reaches were given a value of one (i.e. no zero-flow months). These values were then used to calculate the proportion of the riparian flow reduction to apply to the floodplain invasions along that river reach. The flow reduction is based on the HMU MAR which will underestimate reduction in perennial systems in dry environments, but modelling the cumulative flows from upstream catchments is complicated and was not feasible within the scope of this study. Groundwater availability in non-riparian areas is more difficult to estimate because it will be affected by a range of factors, including depth to the water table, storativity and transmissivity, and plant-related factors such as the depth of the root system and their ecophysiology (Calder, 1999; Le Maitre, 2004; O'Grady et al., 2011). Studies elsewhere have shown that evaporation exceeds predictions based on dryland moisture limits (O'Grady et al., 2010, 2011), with net groundwater discharge ranging from 65-700 m3-yr-1 and total evaporation rates which exceeded the rainfall, similar to young plantations exploiting stored soil moisture (Clulow et al., 2011). However, without lateral inflows, the long-term net incremental evaporation cannot exceed the annual recharge. We adopted the pragmatic solution adopted by Van Wilgen et al. (2008) and set the incremental groundwater discharge to a conservative 1.2 times the dryland reduction (Van Wilgen et al., 2008). 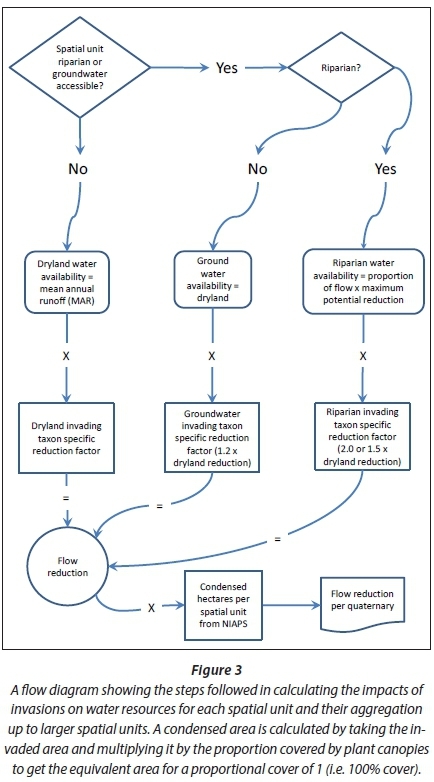 The process followed a logical division of all land portions into dryland, riparian and groundwater aquifer settings, matching each spatial unit to its corresponding MAR and adjustment factors, calculating the reductions specific to each taxon and then aggregating the outputs (Fig. 3). The NIAPS data was provided in the form of two national data sets, one covering the landscape areas (dryland and non-dryland) and the other the riparian areas. The two overlap. Landscape mapping is also available for Lesotho and Swaziland and, because no data were available on riparian invasions, the reductions due to invasions in these countries were only calculated as if they were entirely in dryland settings because the river datasets for these countries were not suitable for extraction of riparian areas. Separate spatial masks were created for dryland, riparian and groundwater aquifer settings and used to create subsets of the invasion data for further calculations. The HMU data were also matched to biomes and the biome that occupied the majority of the area of each HMU was selected. The data were then exported to spreadsheets and summarised for catchments and biomes using pivot tables. The area mapped for the NIAPS covers about 43.4% of South Africa and excludes all the arid bioregions and the areas shown as transformed (e.g. cultivated, urban) in the national land cover (Fig. 4). The concentration of the invasions in the eastern part of the country is very evident with extensive and dense invasions extending from the Garden Route through to Mpumalanga and Gauteng. The extensive invasions along the Drakensberg escarpment from northern KwaZulu-Natal through to Mpumalanga stand out clearly. The Kruger National Park in the north-eastern corner of South Africa was also excluded from the mapping. Invasions in this park are largely of herbaceous species and taxa in the Cactaceae which have relatively low hydrological impacts. 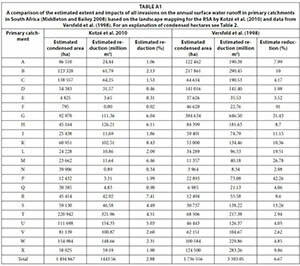 The estimated total condensed invaded area is about 1.50 million ha, with almost 15% of this in primary catchment T (former Transkei) and 10% in catchment W (northern KwaZulu-Natal) (Table 2). Primary catchments B (Olifants), C (Vaal) and U (southern KZN) also have more than 100 000 ha of condensed invasions. All these catchments are on the eastern side of South Africa and, together, account for half the condensed invaded area. The high proportion is particularly significant in Catchment C given that < 50% of this catchment was mapped (Fig. 4). 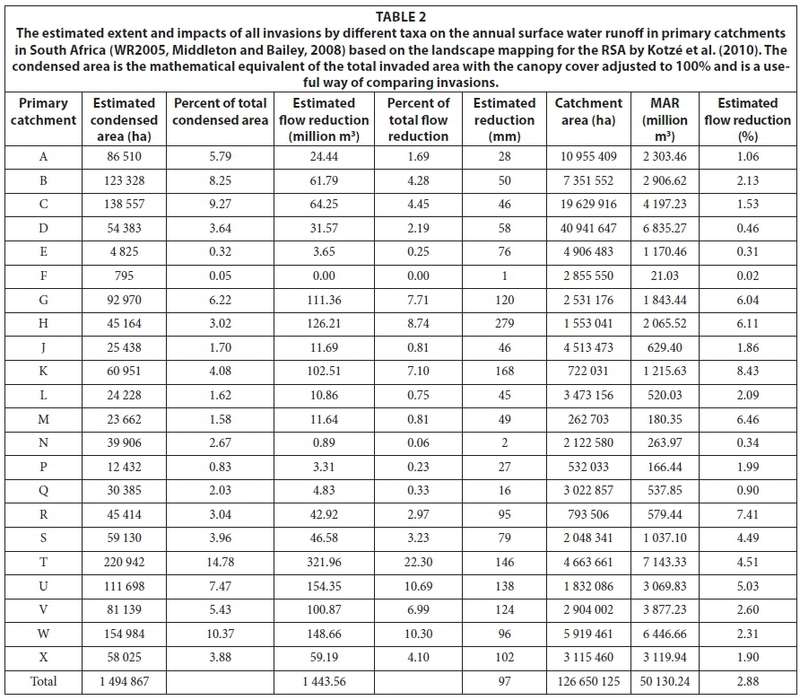 The estimated total flow reduction is 1 443.6 million m3-yr-1, with the greatest reductions in Catchment T, at 322 million m3-yr-1, followed by 154 million m3-yr-1 in U and 149 million m3-yr-1 in W (Table 2). Altogether the estimated reductions in these catchments comprise nearly 45% of the total. The estimated reduction in Catchment D is substantial despite the fact that only about 10% of this catchment was mapped, highlighting the fact that most of the middle and lower Orange River system comprises arid catchments with very low runoff. 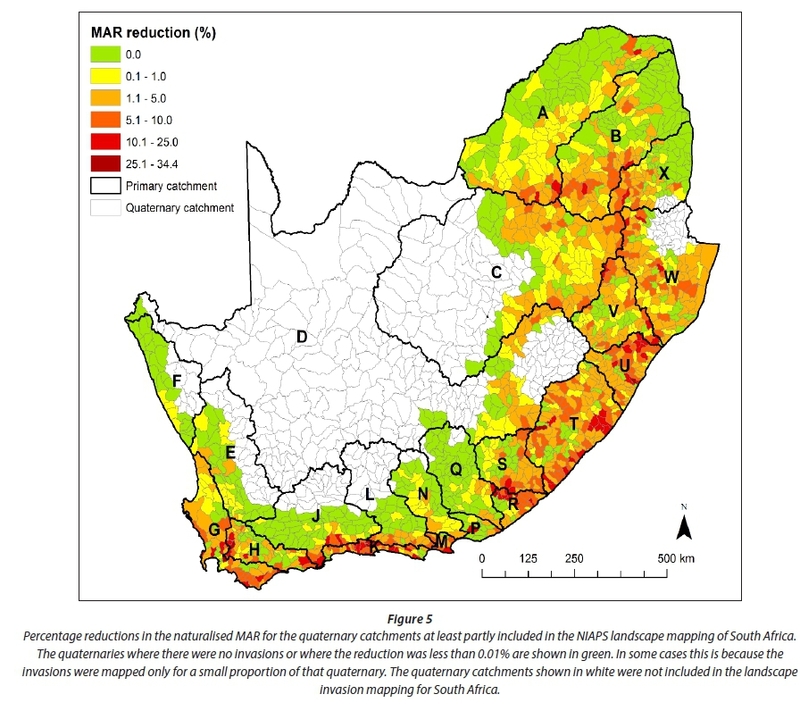 The greatest estimated percentage reductions in naturalised MAR are found in Catchments K (8.4%, Mossel Bay to Tsitsikamma), R (7.4%, Border region, Eastern Cape), and M (6.5%, Port Elizabeth and surrounds) (Fig. 5). This is largely due to the relatively extensive invasions on deep soils with groundwater and in riparian areas in these catchments. Catchment K also has extensive invasions by both pines and A. mearnsii which result in high flow reductions. The estimated reductions in Catchments S (Border region, Eastern Cape), T and U (southern KZN) are all greater than 4.5% with more than 6.0% in catchments G (Berg and Agulhas) and H (Breede). The low percentage reductions estimated for Primary Catchments C, D, E, F and, to some extent, N are misleading though, because only parts of those catchments were mapped for the NIAPS (Figs 4 and 5). The NIAPS datasets include an estimate of the range in the condensed area based on the coefficient of variation in the estimated per cent cover between the sample points in each HMU. The condensed invaded area thus lies between 1.32 and 1.70 million ha (±14% of the mean). The corresponding values for the reductions are 1 304-1 598 million m3-yr-1, or about 11% of the mean. The range in the condensed area is fairly consistent across all the primary catchments, being high (15-16%) in L and X and low (8-11%) in R and G.
Although only about half the Grassland biome was mapped, it has the most extensive invasions, followed by the Moist Savanna biome (Table 3). However, the percentage invasions are relatively low because these biomes occupy 28% and 19% of South Africa, respectively. The Forest biome was the most heavily invaded, and has the greatest proportional reduction in runoff (-20%) of the MAR (but the volume is small), followed by the Indian Ocean Coastal Belt and the Fynbos. The reductions in the Indian Ocean Coastal Belt are high because of extensive invasions by high water-use species such as Eucalyptus cama-dulensis, Psidium guajava, Lantana camara and Chromolaena odorata. By far the greatest reductions in volume terms are in the high-rainfall grasslands, which are a concern since they are a key water source for most of the major river systems in South Africa and the major urban and industrial centres in Gauteng. Invasions by Acacia mearnsii, Eucalyptus, Populus and Salix species have resulted in substantial reductions on a volume basis in the Grassland biome and Pinus species have large impacts in the Fynbos biome. Chromolaena odorata, Lantana camara and Solanum mauritianum invasions also result in substantial reductions in the Moist Savanna biome. An analysis of the riparian invasion mapping for the NIAPS found that the total condensed invaded area was about 195 273 ha, more than twice the estimate based on the landscape dataset. The most extensive invasions occur in Catchments C (35 169 ha, 7.2%) and D (33 230 ha, 4.1%) followed by T (18 492 ha, 8.9%), A (12 084 ha, 4.8%), G (10 097 ha, 12.5%) and H (9 177 ha, 14.5%). The total reduction is about 182.5 million m3-yr-1, with the greatest reductions being in Catchments T (48.3 million m3-yr-1, 0.7%), U (21.9 million m3-yr-1, 0.7%) and V (13.4 million m3-yr-1, 0.4%). Lesotho is situated in Primary Catchment D (Orange River) and covers an estimated area of 3.05 million ha. The total condensed invaded area is nearly 200 000 ha and the total invaded area about 1.65 million ha or 54% of the country. The estimated total reduction is 161.1 million m3-yr-1 (3.6% of MAR) and Salix babylonica, Populus species and Rosa rubiginosa account for 72% of the total reduction. Given that these catchments generate about 67% of the runoff in the Orange River system, the reduction is important. Swaziland is situated in Primary Catchments W (northern KwaZulu-Natal) and X (Inkomati) and covers an estimated 1.63 million ha. The major invading species are Chromolaena odorata (mainly found in the lowveld in the eastern part), Acacia mearnsii and Senna didymobotrya. These three taxa account for 88% of the total condensed invaded area of 144 720 ha, with Psidium guajava, Solanum mauritianum and Eucalyptus species occupying most of the rest. The most extensive invasions are in Catchment W, but this is largely because 84% of the country falls in this catchment (Fig. 4). The total invaded area in Catchment W is about 43% of its total area compared with 40% of Catchment X, with most of the dense invasions in Catchment X (Fig. 4). The concentration of invasions in the valleys is shown by the 'herringbone' pattern of moderate to dense invasions in many quaternaries. The total flow reduction is about 193 million m3-yr-1 r (19% of MAR), with Chromolaena odorata accounting for almost half (90.9 million m3-yr-1). The total reduction in Catchment W is 7.0% of the mean annual runoff versus 11.1% in Catchment X, emphasising the impacts of the species with high unit reductions (mm-yr-1), particularly Solanum mauritianum, Lantana camara and Pinus species. The reductions in both Catchments X and W directly affect downstream users and riparian ecosystems in South Africa, which is important because the water resources are heavily utilised, particularly in Catchment X. These impacts are also potentially important to ecosystems and water-users in Mozambique. Direct comparisons with the Versfeld et al. (1998) data on invasions in the primary catchments are complicated because about half were only partially mapped for the NIAPS (Fig. 4) - about 57% of the country was excluded. Nevertheless, the data show that the estimated total condensed invaded area is now about 1.50 million ha, which is roughly 90% of the estimated condensed area of about 1.74 million ha mapped by Versfeld et al. (1998) (see Appendix 1, Table A1). 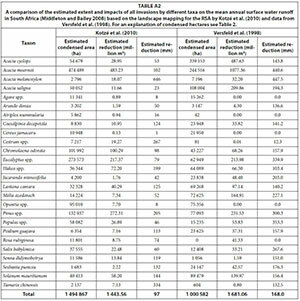 However, the taxa included in the NIAPS only comprised 1.01 of the 1.74 million ha reported by Versfeld et al. (1998), suggesting a net increase of 0.50 million ha in the condensed area of the mapped taxa. There is good reason, though, to believe that this increase is mainly due to the more systematic and thorough mapping by the NIAPS, especially in the Eastern Cape (Fig. 4), and not due to a substantial increase in the extent of the condensed invaded area (see also Van Wilgen et al. 2012). Nevertheless, the differences emphasise the point made by Versfeld et al. (1998) that, although there was a temptation to treat their results as overestimates, they were as likely to have underestimated the true extent of invasions. The extent of invasions in Catchment G (Berg and Agulhas) was overestimated by Versfeld et al. (1998) when compared with the NIAPS, particularly in the coastal lowlands in the Agulhas area and on the west coast (Appendix 1, Table A1). However, Versfeld et al. (1998) underestimated the extent of invasions in all the other primary catchments, notably in N (Sundays) with a nearly 10-fold increase, Q (Great Fish) with 4-fold increase and R (Border coast) and T (Transkei) with about a 3-fold increase in each. The increases in Catchments N and Q are particularly notable, given that only about half of these primary catchments were mapped (Fig. 4). The main reason for this seems to be that the thicket comprises a large proportion of these catchments and this vegetation type was poorly mapped by Versfeld et al. (1998). However, the main dryland invaders in thicket are members of the Cactaceae (e.g. Opuntia species) which are not believed to have a significant impact on runoff relative to the indigenous thicket species they replace. The estimated total flow reduction is 1 444 million m3-yr-1 (or 2.88% of the MAR) which is less than half the 3 303 million m3-yr-1 (6.35%) estimated by Versfeld et al. (1998) (see Appendix 1, Table A1). The estimated mean reduction per unit area amounts to about 97 mm-yr-1 (or 970 m3-ha-1-yr-1) which is about half the 190 mm-yr-1estimated by Versfeld et al. (1998) and very close to the 98.6 m3-yr-1 estimated for commercial forestry plantations (Scott et al., 1998). However, the total condensed invaded area from the 'range' data of Kotzé et al. (2010) is 5.86 million ha, and the matching total reduction is 4 301 million m3-yr-1 (8.6% of mean annual runoff). This is a substantial increase compared with the Versfeld et al. (1998) study. Versfeld et al. (1998) noted that their estimate of the total reduction was considerably higher than those for commercial tree plantations of 1 399 million m3-yr-1 (93 mm-yr-1) or 2.70% (see Scott et al. 1998) but argued that the estimated tree age (and thus size) was much greater, and that much of the invaded area was riparian where the trees would have greater water-use (see also Le Maitre et al. 2000). The lower, and probably more conservative, estimates generated by the approach used in this study have been further reduced by the smaller condensed invaded area, but it is important to recognise that taxa mapped by the NIAPS only accounted for one million of the 1.74 million condensed ha recorded by Versfeld et al. (1998). There were increases in reductions relative to Versfeld et al (1998) in catchments T and U (> 1.2-fold), with decreases in all the other catchments. The decrease in the invaded area in Catchment G results in much lower estimated flow reductions relative to 1998, especially in the Agulhas area. The same applies to Catchment P (Eastern Cape Coast) where Versfeld et al. (1998) mapped extensive invasions of A. cyclops and A. saligna on the coastal lowlands, but many local urban developments have occurred since then. The reductions have also been estimated based on the naturalised flows but should be based on the flows once all other abstractions have been taken into account. Suitable data were not available for all the quaternaries at the time of this assessment (2012/3), but the recently completed 'Water Resources 2012' (Bailey and Pitman, 2015) study will allow for new estimates of the impacts of these reductions based on current-day flows. The current study is particularly likely to have underestimated the extent and impacts of riparian and azonal invasions for the following reasons. Although the reductions in riparian and azonal settings were scaled up 1.5 (or 2) times and 1.2 times, respectively, this adjustment was used only to correct the estimates for the fact that the plants have access to sub-surface water which is not accounted for in the MAR. The adjustment did not correct for: (a) any underestimate of the extent of invasions in riparian zones, or (b) the fact that rivers accumulate flows downstream and that these flows can be much greater than the MAR from the catchment in which the invasions are located. The latter issue is particularly important in perennial rivers which flow through low-yielding catchments, such as much of the middle and lower Orange River, as well as many other river systems across the country. This problem could be addressed by incorporating the new results into water resource assessment models like those used to assess cumulative impacts, as was done by Cullis et al. (2007). The problem of underestimating the extent, and thus impacts, of riparian invasions is not easy to address. Versfeld et al. (1998) generally separated riparian from other invasions, while others have assumed that certain percentages apply: (a) for catchments with > 800 mm-yr-1about 0.25% of the area was considered to represent non-perennial rivers and 0.5% perennial rivers, a total of 0.75% (Cullis et al., 2007); and (b) 1% was considered riparian by Van Wilgen et al. (2008). In this study the condensed hectarage of riparian invasions was 83 511 ha or 5.6% of the total condensed invaded area and the total riparian reduction is 154.5 million m3-yr-1 or 10.7% of the total reductions. Van Wilgen et al. (2008) reported 1% of all invasions as riparian and a total reduction of 3 063 million m3-yr-1 based on the Versfeld et al. (1998) invasion data for selected species. Unfortunately they did not provide separate estimates of the riparian reductions (or the total invaded area) but, given that they used 500 mm-yr-1compared with 185 mm-yr-1for riparian invasions in this study, the proportion of reductions due to riparian invasion was probably much greater than in this study. The mapping done by Kotzé et al. (2010) included 28 taxa compared with the 180 or so mapped by Versfeld et al. 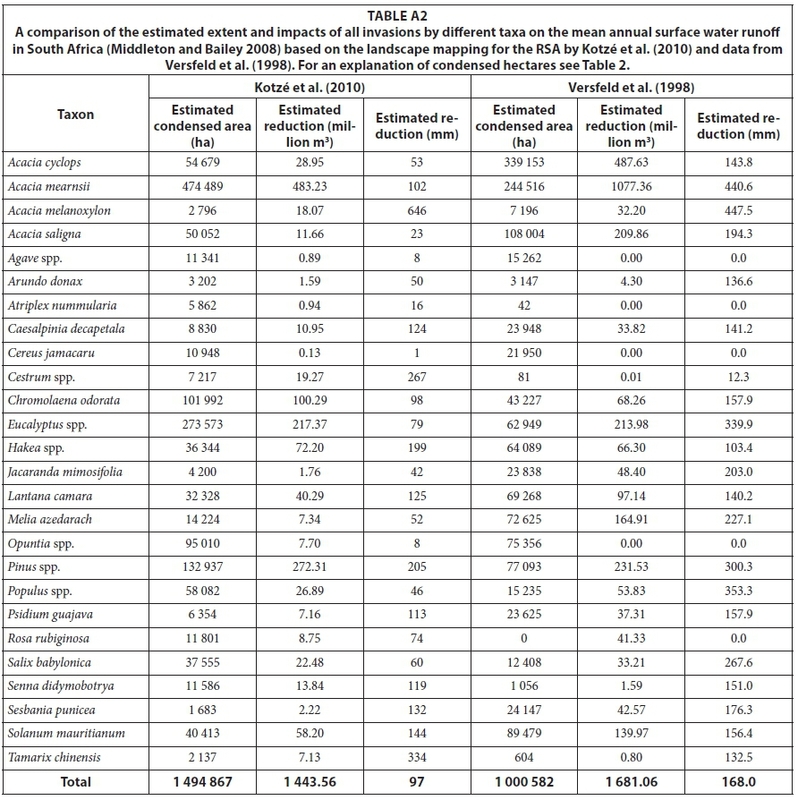 (1998), but the dataset included all the major invaders with some exceptions such as Acacia longifolia and species not readily detectable from the air (see Appendix 1, Table A2). The species which were not included covered substantial areas, as can be seen in the estimated total condensed area for the matched species which is only 1.00 million ha of the 1.74 million ha estimated by Versfeld et al. (1998). Acacia mearnsii (and A. dealbata, A. decurrens) have by far the greatest estimated condensed invaded area, reinforcing the conclusion reached by Versfeld et al. (1998) and others that acacias are by far the most important invading species. Eucalypts and pines have also invaded large areas, as have Opuntia species, Chromolaena odorata, poplars, willows, Solanum mauri-tianum and Melia azederach. Species whose invasions may have been underestimated by the NIAPS include Lantana camara, Caesalpinia decapetala and Psidium guajava, which tend to occur in forest and woodland habitats where they are difficult to spot from the air. The areas invaded by several of the relatively minor taxa have increased substantially (e.g. Cestrum laevigatum, Atriplex nummularia, Senna didymobotrya) but this is off a very small base. The extent of the invasions by eucalypts is surprising because only a few Eucalyptus species are invasive and their invasions are generally restricted to certain habitats (Forsyth et al., 2004; Rejmánek and Richardson, 2011). Acacia mearnsii and allies account for more than 30% of the total flow reductions, followed by pines (18.9%) and eucalypts (15.0%). The increases in flow reductions among the major species, relative to Versfeld et al. (1998), were greatest for Senna didymobotrya (8.7 times), Chromolaena (1.4 times) and Pinus (1.2 times) but most other species showed decreases. These differences are largely due to changes in the extent of the invasions as the per-unit-area impacts are lower in most species, the exceptions including Chromolaena, Pinus, Populus, Salix, Jacaranda, Lantana and Melia. The net effect of all these changes is a decrease in the estimated total flow reduction from 3 303 million m3-yr-1 to 1 444 million m3-yr-1, although the species included in Kotzé et al. (2010) only account for an estimated 1 681 million m3-yr-1 or 51% of the total reduction estimated by Versfeld et al. (1998). A more meaningful assessment of the potential underestimates can be derived from the following: only 4.6% of A. mearnsii, 4.4 % of Eucalyptus, 5.2% of Populus and 5.5% of Salix invasions were considered as riparian in this assessment. However, most experts would agree that at least 10-20% of A. mearnsii, at least 50% of Eucalyptus and almost all Populus and Salix invasions are riparian or within floodplains. If the percentage distributions were adjusted to match expert opinion, it would increase the total reductions by around 1 000 million m3-yr-1 or 70%. Unfortunately, establishing the true proportion of riparian invasions for each quaternary would necessitate a thorough investigation of its own, which was beyond the scope of this study. However, the update of the NIAPS, which is currently underway, should help to resolve uncertainties about the extent and proportions of riparian invasions and, in turn, result in more reliable estimates of their impacts on water flows. Addressing the many other uncertainties identified in this work will require more studies on: (a) important but poorly-known species such as Lantana camara or Melia azederach; (b) investigations into more robust ways of extrapolating from site-level studies to take climatic conditions and moisture availability into account; and (c) more research into the impacts on flow regimes and groundwater storage and, thus, yields from water supply systems, while taking into account current-day flows. This study found that the estimated mean total flow reduction for landscape invasions is about 1 444 million m3-yr-1 (2.88% of the naturalised mean annual runoff) which is less than half the 3 300 million m3-yr-1 estimated by Versfeld et al. (1998). The main reason for this is the lower unit area reduction of 97 mm-yr-1estimated in this study compared with 190 mm-yr-1estimated by Versfeld et al. (1998). Reductions due to invasions in Lesotho are estimated to be about 161 million m3-yr-1 and in Swaziland about 193 million m3-yr-1 (134 in Primary W and 56 in Primary X). The reductions in flows from Lesotho directly affect flows in the Orange River (Primary D), bringing the total reduction to 193 million m3-yr-1 or 2.8% of the mean annual runoff of this entire system. The reduction in flows in Primary X from Swaziland more than doubles the reductions in this catchment to 115 million m3-yr-1 (3.7%). The taxa with the most extensive invasions and the greatest impacts on water resources are Acacia mearnsii (474 489 condensed ha, 34% of the total flow reduction), Pinus species (132 937 ha, 19%) and Eucalyptus species (273 573 ha, 16%). Chromolaena odorata (101 992 ha, 7%), Hakea species (36 344 ha, 5%) and Solanum mauritianum (40 413 ha, 4%) also have important impacts on runoff. Together these taxa account for 85% of the total impacts on runoff. The Forest biome is the most heavily invaded and has the greatest reductions (17.1%) but is very limited in extent. The Grasslands and Moist Savanna biomes have the most extensive invasions with the Grasslands also having the greatest volume reduction followed by the Fynbos, Moist Savanna and Indian Ocean Coastal biomes. The Indian Ocean Coastal Belt biome has the 2nd highest percentage reduction followed by the Fynbos biome. The approach used in this study was designed to provide a more robust, more defensible and probably more conservative (i.e. lower) estimate than was given by Versfeld et al. (1998). However, there are sound reasons why we consider this new national estimate to be overly conservative (i.e. too low), the main ones being that both the extent and the impacts of riparian invasions were underestimated and that landscape invasions were mapped for only about half of South Africa. These findings all suggest that the actual reductions are highly likely to be greater than the estimated mean of 1 444 million m3-yr-1 but possibly not as much as the 3 300 million m3-yr-1 estimated by Versfeld et al. (1998). This research was funded by the Working for Water programme, Natural Resource Management programmes, Department of Environment Affairs from the Operational Support and Planning Project. We thank colleagues for comments and advice on the structure and content of the paper.